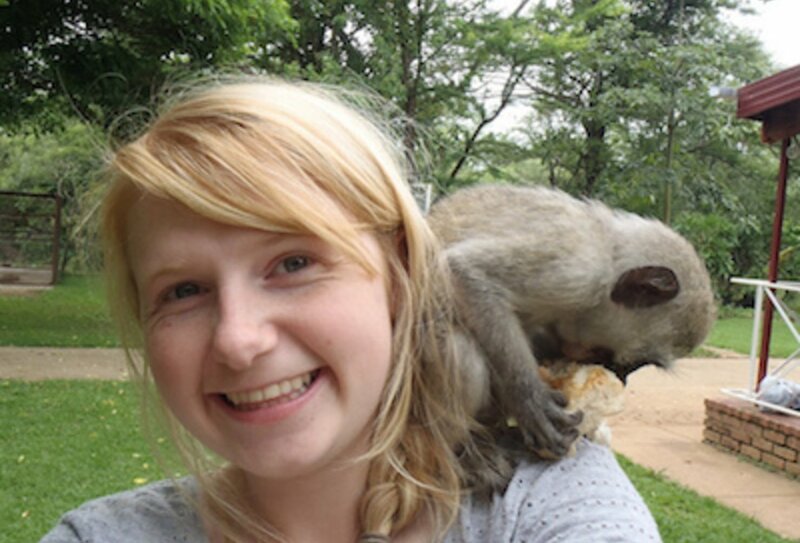 Hands-on rehab project with cheeky primates! At our monkey and ape rehabilitation sanctuary in South Africa you can help to rehabilitate and release injured, orphaned and abandoned monkeys, bush babies, baboons and other animals until they can be returned into the wild. Helping to feed your new monkey mates as a volunteer, during this special South African sanctuary trip, typical tasks will include constructing new enclosures, planting vegetables and for a truly special and worthwhile experience, bottle-feeding the babies! Experience other South African attractions such as seeing a 6000 year-old baobab tree, visiting local villages and soaking up the scenery. It’s not all about sanctuary work, but a chance for you to make a real hands-on difference and help out some real cheeky monkeys! Have an amazing time in South Africa, see stunning sights, explore and go on safari in your spare time! 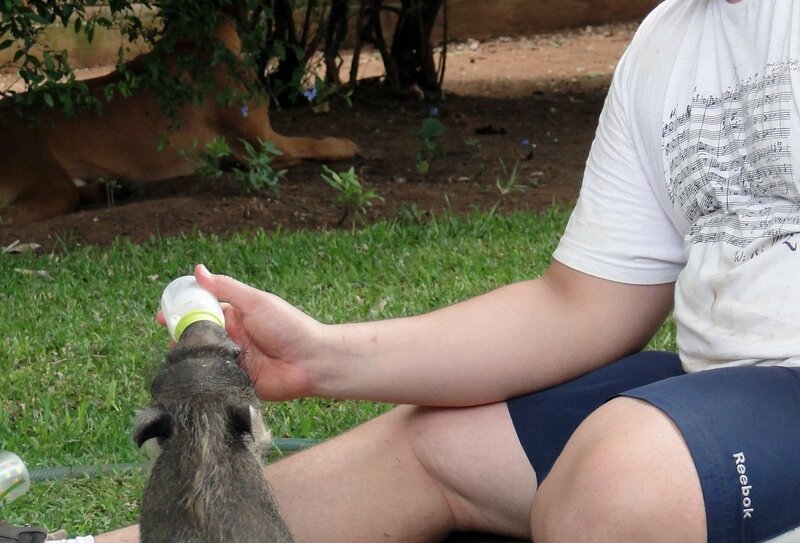 A girl feeds an adorable baby monkey milk from a bottle on her gap year in South Africa. A girl plays with a monkey in a monkey sanctuary in South Africa as part of her wildlife-friendly gap year experience. Two girls are sitting down and one has a young boar on her lap in this wildlife sanctuary in South Africa. 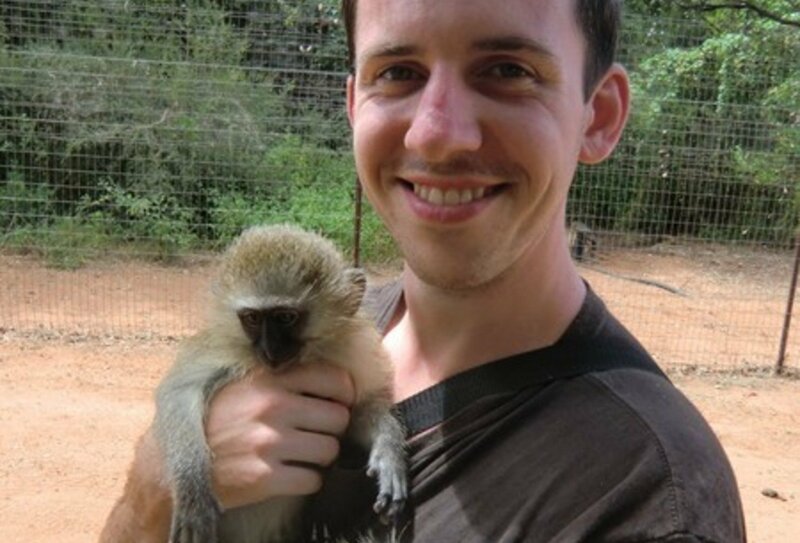 A young traveller holds a monkey with a big smile on his face, having fun and helping wildlife at the same time on his gap year to South Africa. 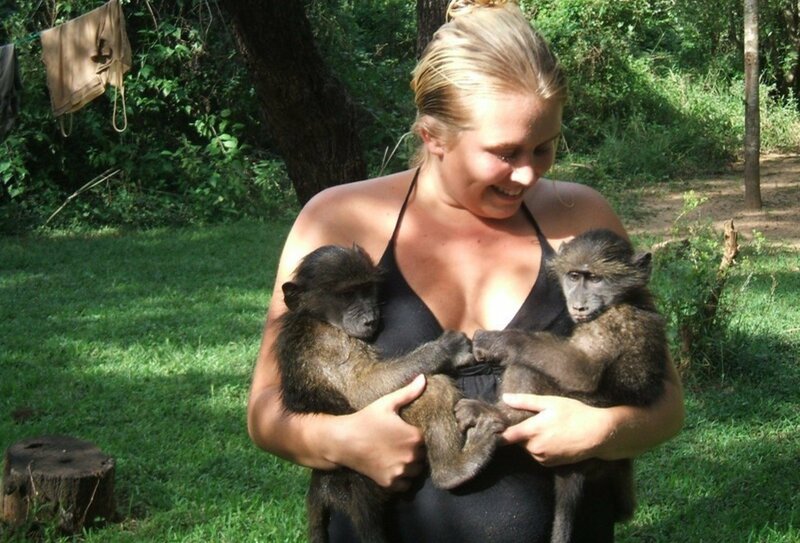 A girl cuddles two monkeys in a wildlife sanctuary in South Africa. Relax at the volunteer house with your group! 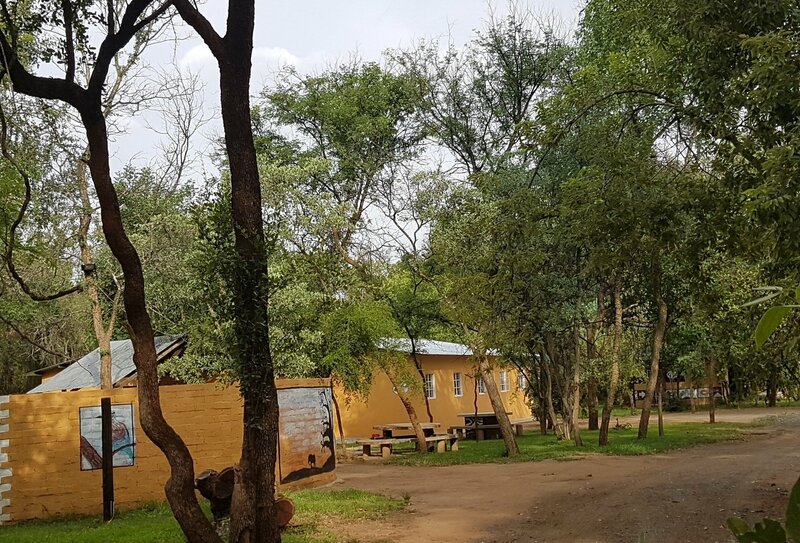 Established in 1995, this monkey sanctuary and rehabilitation centre provides temporary sanctuary for vervet monkeys and other orphaned or abandoned animals. Many of the animals have previously been kept in captivity, and sadly many are unwanted pets. The sanctuary staff rehabilitate the animals with the aim of ultimately releasing them back into the wild, if possible. 6:45-7:00am - An early start - monkeys don’t do lie-ins! Your mornings will be dedicated to jobs around the Monkey Sancturary. You'll get stuck in with cleaning their cages, preparing their breakfast and feeding the animals. You’ll also spend the rest of the morning working on various projects specified by the staff. 13:00 – 14:00 (approx.) - Lunchtime! 14:00 - Activities in the afternoon vary depending upon the needs of the centre, though tasks often include monitoring or playing with the animals. Sometimes there will be free time here, so volunteers can relax or go on excursions with other members of the group. 19:30 – After dinner you will have the rest of the evening as free time to relax. Please note that due to the nature of this project anything can happen and due to the animals, sometimes an entire day’s plan can change! Working hands-on with the animals at the sanctuary, you’ll be getting very up close and personal - so much so, that during the months when orphaned babies arrive at the sanctuary, all volunteers take it in turns to look after and feed them night and day! This particular activity is rather special, and often includes bottle-feeding baby monkeys, warthogs, bush babies and baboons. When not out playing doctor and doing your rounds, there are other activities you can get involved with, such as researching the habits of the vervet monkey. We will only be able to offer these projects to those who will be at the centre for a minimum of 6, or 8 weeks (sometimes even longer). This is to enable you to fully understand what is required from the project, and more importantly give you time to be accepted by the monkeys! To get to the project you will need to book a flight to Phalaborwa Airport in South Africa. Most flights will have a connection via Johannesburg. When you land into Phalaborwa on your start date we will meet you and drive you to the project. We can help you book flights so please give us a call! Staying in rustic style dormitories enveloped in unspoilt South African bush, you can wake up in the morning to native birdsong and drift off to sleep to the calming sounds of the African bush at night. If you want a full outdoors experience to really make the most of your time under the African sun, then sleeping outside can be arranged. Rooms are based on 3-9 people sharing. Sexes are normally split, but within small groups volunteers often choose “mixed” dorms. Couples can also be accommodated (subject to availability). With flush toilets, hot showers and electricity points available in the dorms, you’ll be living comfortably and will be able to charge mobiles/cameras (as long as you remember to bring a South African adaptor plug). Sheets, duvets and pillows will be provided, though you many want to bring a sleeping bag if you are at the project during the winter (June & July) as it can get very cold at night. The staff will also do your laundry (for a small fee), if you don’t want to hand wash your own clothes. Each dorm will have a set day for laundry, which the staff will inform you of when you arrive. When you have completed your jobs for the day, you can cool off with a swim in the pool or relax at the river; bird watching and enjoying the colours of a true South African sunset. During the summer this picturesque scene truly comes alive at night, as the banks of the river are transformed by hundreds of fireflies. Mosquito nets are not really a necessity but you are welcome to bring your own if you wish. They are cheaper to buy in South Africa than the UK. Three meals a day, teas and coffees are included in the price of your monkey sanctuary experience. A semi-continental breakfast is served at 9am, with lunch at around 1pm normally consisting of sandwiches or hot dogs. Dinner is at 6pm and during weekends you’ll get the opportunity to experience South African braais (BBQ’s) and help prepare your own traditional potjie (stew). Vegetarians and vegans can be catered for on request. The minimum age to come on this monkey experience is 18. Don’t worry if you haven’t had any previous experience working with animals, you will receive all the necessary training at the centre. You do however need to be healthy, fit and of course have a passion and love for animals! Nationals of the EU, USA, Canada, Australia and New Zealand don’t require a visa to enter South Africa, though South African Immigration does ask that you have two completely blank consecutive pages in your passport. As long as you hold a valid passport (and a valid return ticket) you will be granted a temporary visitor’s permit on arrival, allowing visitors to stay in South Africa for up to three months. You should also ensure that your passport will still be in date for six months after you return. Helllo, anyone doing the capetown volunteering and road adventure trip starting 2nd Feb 2019?